Luna Palace Hotel & Suites is located on Gaviotas Beach, one of the best beaches in Mazatlàn, between the Golden Zone and The Marina. 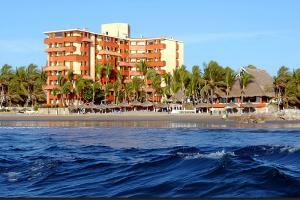 The hotel's 71 large rooms are decorated with beautiful Mexican accents. Most rooms face the ocean, and afford spectacular views of the Three Islands. Located just twenty minutes from the international airport.